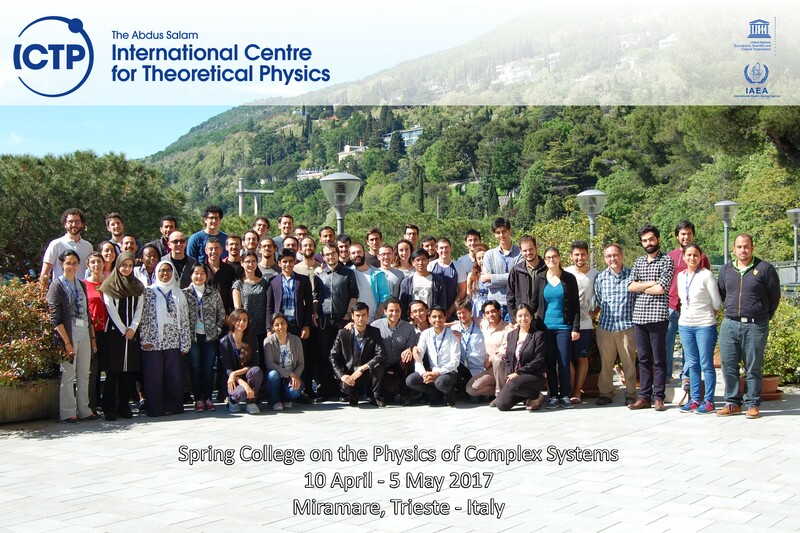 ICTP and SISSA, in collaboration with the partner institutions of the Master in the Physics of Complex Systems (http://www.polito.it/pcs) will organize the Spring College on the Physics of Complex Systems from 10 April to 5 May 2017. Many complex systems in physics, biology, engineering and economics are characterized by a large number of interacting degrees of freedom giving rise to a non-trivial collective behavior. The theoretical and computational tools for a quantitative analysis of complex systems are often rooted in modern (statistical, quantum) physics. The Spring College on the Physics of Complex Systems aims to give students the opportunity to get in touch with a selection of topics at the forefront of research during an intensive 4-week program. It consists of 5 courses of 9 lectures each, followed by final written tests.